Nature has so much beauty to display and being able to see it up close is a rare moment to have. To be able to gaze at and experience the majestic sight of how our world moves and works in its own unique ways could just give you goose bumps trying to take in every single aspect of it. It is awe-inspiring, marvelous, and full of wonder. It fills you with a sense of exhilaration and captures your breath as you see it unfold right before your eyes. Despite the amazing spectacle of the earth with all its flora and fauna, our actions as human beings have caused it to deteriorate and drain all of its life away. Now, many creatures on land, sea, and air are suffocating, struggling to survive, and eventually when they have no other lifeline, they die. Several species have become extinct and many others are endangered because of the destructive human activities and other anthropogenic practices that we have all contributed to at one point or another. However, there is hope for much of the world’s resources and wildlife. One such example is the leatherback sea turtle, the largest living turtle in the world. There have been sightings of these magnificent creatures around the world emerging from the sea to lay its eggs during mating season. It is one of the species included in the endangered list of the National Oceanic and Atmospheric Administration. However, recently, the NOAA has been considering removing it from the list. Last year, there was a petition asking the institution to change its status from “endangered” to “threatened”. It may not necessarily be the greatest news as it will become downgraded, but it does give a sign that with enough effort and the right initiatives, we can save, protect, and preserve our natural resources and the wildlife on which we depend. We all live in the same earth and it is our responsibility to make sure that we take care of it. 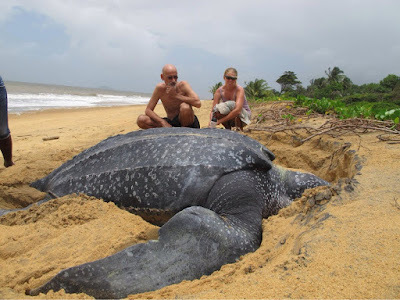 Leatherback turtles have been listed by the International Union for Conservation of Nature as “critically endangered”. NOAA cited that they have found substantial scientific and commercial information suggesting that the petition for it to be downgraded a notch may be warranted and they are currently thinking of changing it. Nonetheless, this does not make their situation any less serious as they would still need careful attention and monitoring to ensure their survival. These turtles can usually grow until six feet and weigh from 550 to 2,000 pounds, definitely making it one of the biggest turtles. One of its marked differences from other turtles is that they lack scales or a hard shell. They have a tough, rubbery skin which gives the inspiration for its name. They can be found all the way up to Canada and the northern Pacific Ocean however, they prefer to stay in the tropical areas. Often, these turtles would come out of the ocean, go to shore, dig a nest, and lay their eggs. Afterward, they go back to the ocean leaving their eggs to hatch. When the eggs do hatch, they fend for themselves, hoping to reach the ocean safe and alive. Most of the baby turtles actually depend on the light of the moon to guide its way back to the ocean however, there are instances when these turtles would be distracted by the lights being given off by commercial establishments near beaches and so, not a lot of them survive in the end. The turtles take 15 to 50 years to mature and they can live for up to 100 or so years. Some of the common threats to these turtles include marine pollution, by-catch or catching them unintentionally, and the harvesting of their eggs.